This article first appeared in the Rushville Republican on December 3, 2017. Gifts to the Rush Memorial Hospital Foundation can come in many different forms. At this time of year as we see the fields being harvested, farmers may give gifts of their grain to the RMH Foundation. Giving a grain gift can become a tax savings as the cash basis farmer avoids having to include the sale of the cash grain crop income, which results in saving self-employment tax, federal income tax, and state income tax. The grain donor should always consult with his or her professional tax or legal advisor to determine the tax implications prior to making the gift. How does this charitable program work? The grain donor picks up a gift of grain form from the RMH Foundation, fills it out, and returns it to the RMH Foundation. The RMH Foundation then sets up an account with participating elevators. Rush County elevators such as Bunge, Gavilon, and Falmouth Farm Supply have agreed to participate in this program. The grain is then delivered to the participating elevator. Transfer the grain as a gift to the Rush Memorial Hospital Foundation and then have the elevator send the RMHF a receipt with RMHF as the owner of the grain. The grain is then sold the day of notification and the sales of that donated grain is then given to the Rush Memorial Hospital Foundation as a charitable gift. This charitable method of giving allows the farmer to choose the amount of bushels that the farmer wishes to donate. “This charitable program is a win/win for everyone. The farmer gets a tax savings on the grain gift and the RMH Foundation gratefully receives the monetary gift. The RMH Foundation is so appreciative of the support of our agriculture community. These types of donations allow us to expand and improve our services at Rush Memorial Hospital. What a great way to leave a legacy of continued exceptional health services for future citizens in Rush County,” Faith Mock, RMH Foundation Director, said. As a thank you to the Gifts of Grain, donors will receive a beautiful Gifts of Grain Donor sign to place on their property along with a letter of acknowledgment of the gift. 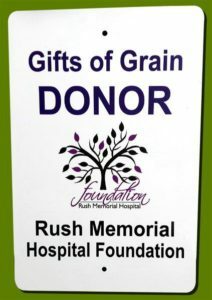 Interested grain donors can contact Faith Mock at the Rush Memorial Hospital Foundation Office at 765-932-7568 for additional information and for Gifts of Grain donation forms.